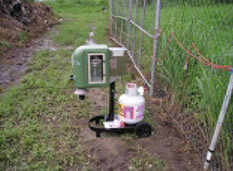 Tests were conducted in tropical Far North Queensland to compare the performance of the two mosquito traps in the public consumer market that are thought to be the most effective: the Mega-Catch™ ‘Ultra’ (Envirosafe Technologies, New Zealand) and the Mosquito Magnet ‘Pro’ (American Biophysics Corporation, USA). In this report, we describe and discuss the performance of these two traps. The Mega-Catch™ ‘Ultra’ had a significantly greater mean catch per night. Both traps caught similar numbers of species, in similar proportions. A wide variety of mosquito traps are available to public consumers, particularly in the USA, where emerging fatal mosquito-borne illnesses stimulate the market for such devices. However, there are few scientifically sound comparisons between available traps. In this report, we describe the mosquito-catching abilities of the two traps thought to be the most effective: the Mega-Catch™ ‘Ultra’ (Envirosafe Technologies, New Zealand) and the Mosquito Magnet ‘Pro’ (American Biophysics Corporation, USA). The study was conducted at the Cairns City Council Waste Transfer Facility in Smithfield, a suburb of Cairns. The study site was an open, grassed area featuring large mounds of garden and tree waste, other solid waste (e.g. disposed whitegoods, recyclable containers) and two creeks with little or no littoral vegetation. The site was immediately bordered to the east by a Melaleuca forest adjacent to mangroves. Almost all mosquitoes captured in the study are probably from this adjacent forest and marsh. Figure 1. The two trap types compared in this study. The two traps (Figure 1) were operated according to the manufacturer's instructions, utilizing octenol lures supplied with the traps. They were rotated randomly through 12 sites over 12 nights (from approximately one hour prior to sunset until approximately one hour after sunrise) in early 2004. This rotation negated any influence of position on trap performance. 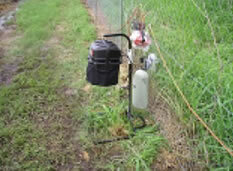 Both traps employ multiple attractants for mosquitoes. These are summarized in Table 1. Heavy rainfall was experienced at the study site in the two days prior to the study (243mm in two days), and after five days of trapping (133mm on one day). The latter rainfall event halted trapping for two days. The study can be divided neatly into two halves on the basis of rainfall, with wet conditions during the first six trapping dates (falls totaling 114mm), and relatively dry conditions on the last six (10.4mm). Wind was primarily from the south and east for the duration of the study while relative humidity was generally greater than 70% overnight. The replication employed in this study should have negated any positional effects created by the weather. The heavy rainfall that halted the study halfway probably served to stimulate mosquito host-seeking behavior in the following days, as well as aiding population growth for the weeks that followed. A total of 68,939 female mosquitoes were captured by the two traps compared here (Table 2). The Mega-Catch™ ‘Ultra’ caught the greatest number of mosquitoes (average: 3707 mosquitoes per night), followed by the Mosquito Magnet Pro (2037 mosquitoes per night) (Figures 2 & 3). In comparing these traps, it is worth noting that the Mega-Catch™ Ultra out-performed Mosquito Magnet Pro on 10 of 12 nights. Although both traps captured biting midges (Ceratopogonids), the latter appeared to catch more. Mega-Catch™ 'Ultra' captured mosquitoes belonging to 17 species, whereas Mosquito Magnet ‘Pro’ captured 18 species. Figure 2. Graph showing average female mosquitoes caught by each trap per night (± SEM). Figure 3. Total mosquitoes caught by each trap over the 12 nights of the study. Also shown is the number of mosquito species caught in each trap. For the purposes of comparison, we grouped the mosquito species captured during the study into the following categories: total Anopheles, total Culex, total Ochlerotatus vigilax and total other species. These categories serve to divide the most important mosquitoes up according to their ecological requirements and disease-carrying abilities. These are described in Table 3. Table 3. Ecological and disease-carrying characteristics of mosquito groups reported on for this study. The proportion of each mosquito category captured by both traps was calculated (Figure 4). These graphs show that both the Mega-Catch™ ‘Ultra’ and the Mosquito Magnet ‘Pro’ capture similar groups of mosquitoes. Figure 4. Groups of mosquitoes captured as proportions of the mean nightly catch. Comparing the mean catch for the two traps permits an evaluation of their effectiveness. However, to determine whether the differences seen in Figures 2 and 3 are valid, we have employed both parametric (t-test) and nonparametric (Mann-Whitney rank sums test) statistical tests (Table 4). Put simply, such tests estimate the chances that the differences seen in Figures 2 & 3 are actually real, and not simply due to chance. In general, if the probability that the differences shown in Figures 2 & 3 are due to chance or fluke is 5% or less, we consider that the differences between the traps are most likely real. for the two traps compared here. Both statistical tests indicate that the difference in the performance of the two traps is probably not due to chance and is real. The Mega-Catch™ ‘Ultra’ Mosquito Trap was the best performed mosquito trap in this study. Its physical design, coupled with the presence of carbon-dioxide (delivered from a cylinder) and other chemical and thermal attractants make it highly effective in catching mosquitoes. In this particular context, it was more successful than the Mosquito Magnet Pro, which is also a very effective mosquito trap. The Mega-Catch™ ‘Ultra’ employs several design features that may prove attractive to mosquitoes. Carbon-dioxide is likely to be the most important of these, serving as an attractant over several metres. The visual nature of the Mega-Catch™ ‘Ultra’ – a dark, well-defined object of similar size to a small human, calf or dog - may also prove to be attractant as well. It was noticed on many occasions that mosquitoes would land on the trap prior to it being switched on. At least some mosquito species use visual cues to locate hosts. Although it is not known whether these mosquitoes were host-seeking, it is possible that the physical design of this trap acts as a further attractant. This aspect of attractancy was not tested here. The Mosquito-Magnet ‘Pro’, while not performing as effectively as the Mega-Catch™ ‘Ultra’, can operate independent of AC power. This is an attractive design feature. It should be stressed that the relative importance of the various design features of these traps was not tested. Furthermore, the ability of these traps to reduce the rate of mosquito attack on humans was also not tested in this study.